If you don't know how to use it, a power meter is just an overpriced cycling computer. 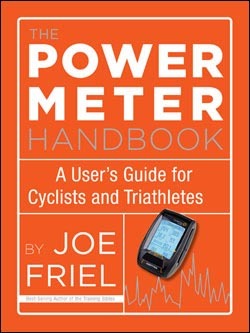 Joe Friel's new book The Power Meter Handbook makes understanding a power meter easy. In his friendly user guide to power meters, the most trusted coach in cycling and triathlon offers a simplified approach to using a power meter for road cycling, triathlons, time trials, century rides, and Gran Fondos. The Power Meter Handbook is now available in bookstores, bike and tri shops, and online. Preview the book at www.velopress.com/power. Friel's approach to power meters can immediately improve a cyclist's speed and power. After learning Friel's recommended ways to set up a power meter for specific uses, riders will master the basics and learn their key power numbers. By focusing on the most important numbers, cyclists and triathletes will discover hidden pockets of power, find ways to improve their pacing, and find out how many matches they can burn on any given day. The Power Meter Handbook includes weekly training schedules to prepare more efficiently for road racing, time trials, triathlons, and century rides. Riders will match their training to their upcoming race or event schedule and push their power envelope step by step. Friel explains how to sift through noisy data to find the numbers that matter, pinpointing fitness changes to peak predictably for key events. Friel's 12 power-based workouts will build up a rider's power profile through aerobic endurance, muscular force, sprint speed, and climbing ability. Power meters aren't just for racers anymore. Friel's Power Meter Handbook makes it easy for any cyclist or triathlete to find new speed with cycling's most effective training tool. Joe Friel is the best-selling author of The Cyclist's Training Bible and The Triathlete's Training Bible and is a cofounder of TrainingPeaks, the most popular training software platform. As one of America's most trusted coaches, he has trained national athletes and represented the United States at world championships. Learn more at www.TrainingBible.com. VeloPress publishes books for cyclists, triathletes, and runners that help beginners and committed athletes build fitness and achieve their goals. VeloPress is a division of Competitor Group, which publishes Velo, Triathlete, Inside Triathlon, and Competitor magazines. For more information, please visit www.velopress.com.